Vertical dropout's. 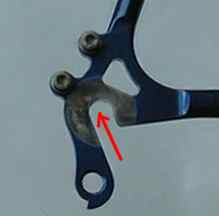 Most common type of dropout found on new derailleur equipped bikes. Advantage is that rear wheel replacement with quick release is slightly easier. 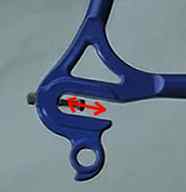 Disadvantage is no horizontal adjustment of chainstay length available to allow for chain/sprocket wear or rounding chain length up or down to the nearest whole link value. If you want to use a fixed wheel or hub gears with this frame you will need a chain tensioner. Apparently there are some bottom brackets being made that will allow some chainstay length adjustment. But I'm not going to recommend products that I have never seen. Track dropouts offer most horizontal adjustment and are very suitable of fixed wheel bikes with flipflop hubs. Note that this frame does not have a mounting for a derailleur rear mech.